Cost: $16.00 a session (members), $24.00 a session (non-member) Buy 4 sessions and get the 5th Session free! This class will teach beginning students how to paint with oils, and help more advanced students refine their skills. We will learn basic techniques, composition, and color theory. Students will learn to create original paintings, using objects from life and/or photographic reference. Our focus will be centered more on realism, rather than abstract. Each student will work at their own pace and will receive individual instruction as needed. 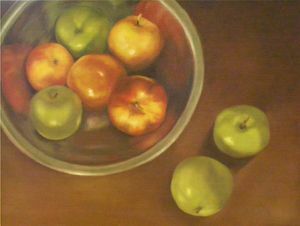 Some objects will be available for use and inspiration in painting a still life; however, students are encouraged to bring their own objects and reference photos. Instructor: Amy VanGaasbeck has been a local success story by taking a hobby and making it into a successful art business. Crossroads is pleased to offer a weekly class in Oil painting where beginners can learn and experiment and intermediate and professional can get additional support and studio time!